“Why should we stop in Sydney?” is a question we’ve heard many times. It also has many answers. Sydney, located on Cape Breton Island in eastern Nova Scotia is the nearest major port to the renowned Cabot Trail, a nearly 200-mile loop that boasts some of the world’s prettiest views. 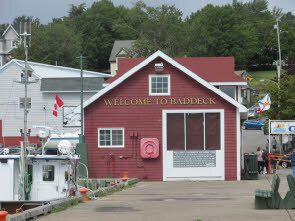 It also has historical significance as the gateway to Baddeck, the summer home of Alexander Graham Bell, a reproduction of 18th century fortified city of Louisbourg that had been destroyed by the British, and a rejuvenated downtown area. 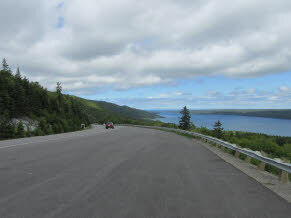 On this trip, our third to the region, our focus was on the Cabot Trail. A bit of a backstory: When we booked our cruise, the schedule called for a long stay in Sydney, enough for us to take an eight-hour tour of a good portion of the Cabot Trail. Yet, a few months before the cruise, we learned our stay was to be shortened by a few hours. So, we went for plan B – a sailing trip on Cape Breton Island’s Bras d’Or Lake and a short visit to Baddeck that we booked through the cruise line. It turned out to be a blessing in disguise, an enjoyable tour to a place we’d never been – and we would return. Our bus crossed the Seal Island Bridge, which connects the two main islands of Cape Breton. 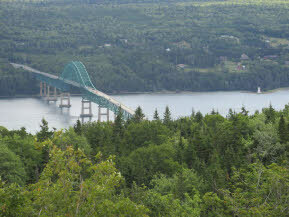 We passed Kelly’s Mountain – where buried treasure is, supposedly, made a sharp turn at Devil’s Elbow, and stopped at St. Ann’s Lookout for a beautiful view of the bridge and surrounding verdant landscape. At this point, we were near, but not on, the Cabot Trail. 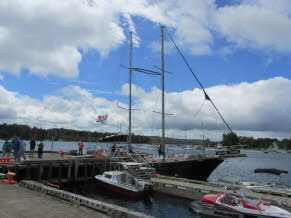 The visit to Baddeck had two portions. 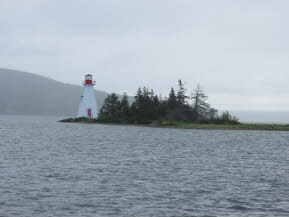 The first was to enjoy a portion of the Bras d’Or Lake for a 90-minute spin around the peninsula where Alexander Graham Bell made his home. Despite the name, it is not truly a lake as it is connected by two channels to the Atlantic. 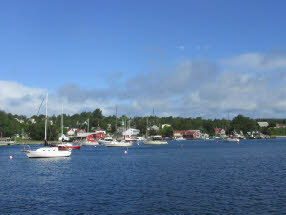 Baddeck is located on one of these channels, and that is where we boarded the sailing ship Amoeba (name represents “a new life”). 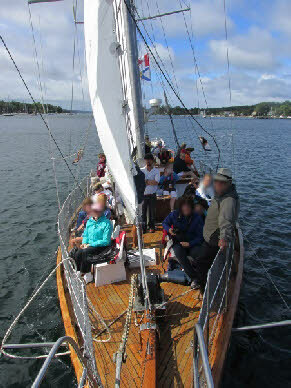 The ship was small, but sturdy – her captain told us that Amoeba had taken him and his family many places, including Bermuda and the entire east coast of the United States. We watched the captain’s two-man crew hoist the sails. We would tilt to one side every once in a while. 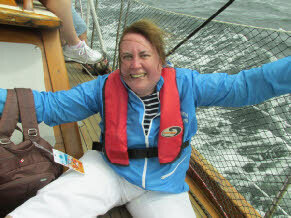 I even fell off my seat onto the deck and had a great laugh, and laughed harder when I realized Neil had been video-recording something else and turned toward me just as I exclaimed, “Whoa!” It was so hilarious that I will share it with Nautical Notebook readers. No injuries, just one small scratch and a great memory. The boat ride was nice, small scratch notwithstanding. 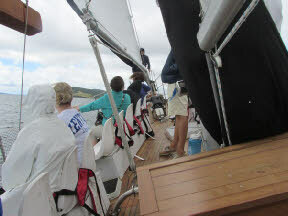 We traveled under sail on the way out and under diesel power on the return trip. It was not in the central part of the lake as I had expected, but that was okay. There were no bald eagles in sight as there usually are, and it was explained to us that this was a tough winter and no eagle babies were born. 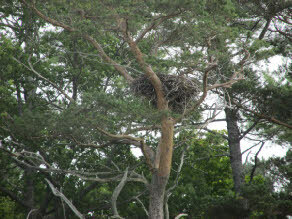 We did see a few nests, thought. 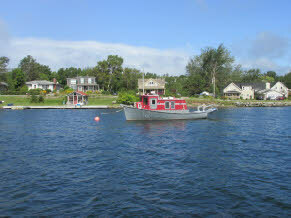 We had about 45 minutes to walk around Baddeck. It’s a cute town – I equated it to Cape Cod. 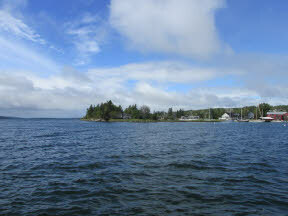 (Baddeck is to Nova Scotia as the Cape is to Massachusetts). We could have gone to the nearby Alexander Graham Bell Museum, yet figured it would deserve more time. We strolled through the neighborhood near the pier, did some shopping – I bought a couple of books, of course – and enjoyed some ice cream shakes. 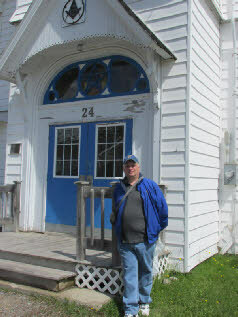 We then went to St. Mark’s Masonic Lodge (corner of Queen and Grant Streets) for Neil’s obligatory photo. 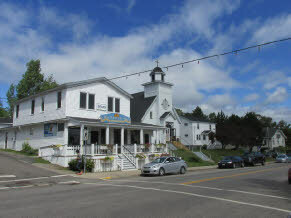 The lodge was built in 1898 to resemble a church. This was a great tour, even though pricey ($150 per person), yet I’d do it again. Just note that this is not a quiet, peaceful, tranquil, glide through the lake. 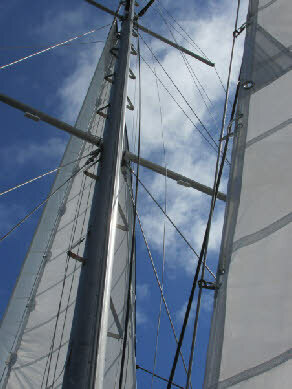 It is sailing, with all the pitches, rolls, and sea spray. Someday, we hope to get to the Cabot Trail, but we may save that for a land vacation. In any case, Sydney is well worth the visit and I recommend that future cruise passengers book a tour to get the most of the visit.